In July I was “fit for fight” again and teaching at two different studios in Oslo, getting up at four to do my own practice walking straight into a four hours session of Mysore teaching plus afternoon classes. And I loved it. I loved being totally immersed in Yoga, getting out of my practice and straight into the flow of adjusting, advising, attending to students, seeing the same faces every day and help them through their progress and challenges. I also loved having the excellent Norwegian facilities like my own changing room -and having soy latte brought to me during my long morning teaching session by receptionist Minka. THANK YOU! Having lived through the earthquake in Nepal and its aftermath, I had set up some fundraising classes to help the victims. Here the Norwegian angels had truly done their work spreading the word, so that and amazing number of 36 students turned up for the class at AYO, and a whole bunch at Puro even in the midst of summer holidays and in spite of excellent weather! The highlight of the summer and possibly the beginning of a new era in my life, was definitely Norges Yoga Festival at Nosen, to which Alex had invited me and also asked me to bring a Buddhist scholar. Alex never does things half way, he himself having invited two brilliant scholars from Mysore, so I thought I`d betterlive up to his standards by finding someone really excellent. 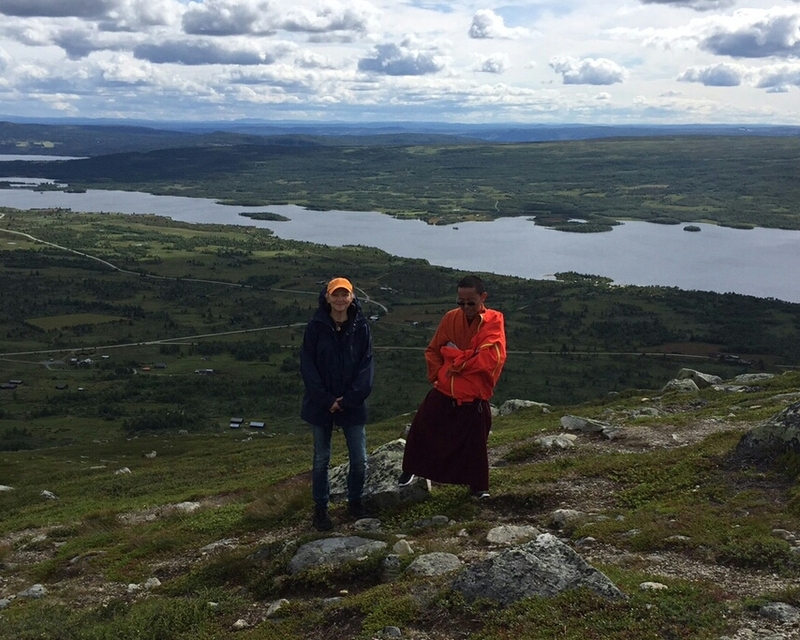 Luckily I was able to get Dolpo Tulku Rinpoche over from Berlin to spend a whole week in Norway. I must admit I was a little nervous about attending to such a high lama, but all my worries melted away as a smiling Rinpoche turned up at the airport handing me a bar of chocolate as a gift. He seemed totally comfortable with only me turning up with a single katha (white blessing scarf) and a train ticket - rather than a big congregation of students and a fancy car, so off we went to Oslo chatting in Tibetan on the train and gazing into the light Norwegian summer night. The next morning we were off to Nøsen for a week if interdisciplinary discussions, Yoga, Sanskrit and much more. I was truly movedby Rinpoche’s presence, his kindness and his way of communicating in a simple undogmatic way. He seemed to connect so easily with every one making friends wherever he went. The week felt to me like a really blessed time, not only from being close to Rinpoche, but it also felt like something new was starting in Norway- something I was proud to be part of. The Yoga festival at Nøsen seems to have grown out of Alex´s effort to live a yogic life, and it appears that someone has to start doing the right thing, and then others will follow. This festival was really a tribute to yoga and true to its intent: we practiced all aspects of Yoga without compromise, we delved into its philosophical roots and investigated its common ground in Buddhist and Indian Philosophy. The place itself is an excellent venue for retreats and at the same time seems to provide an excellent project for BITR (Back In The Ring) participants. And as for new friendships this summer has been truly great. I am looking forward to spend more of my future with :Karin , Kristine, Martine, Tina, Øystein, Ole, Ellen, Omar, Minka, Karina and all ather new and old friends from this summer! May you all live long and Practice the Dharma!